L'Aubergade Cider, Ale & Sausage Festival - Amount Raised! L’Aubergade Cider, Ale & Sausage Festival – Amount Raised! Perfect sunshine, smiling faces and great music! 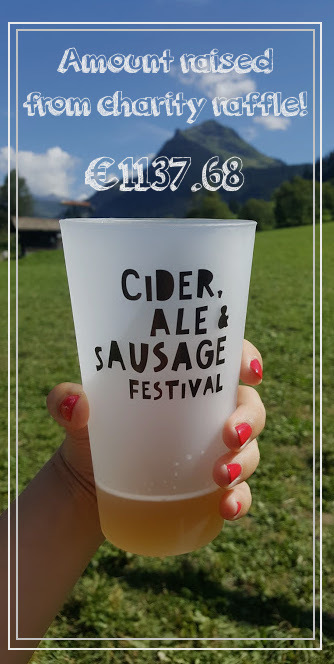 Last weekends L’Aubergade Cider, Ale & Sausage Festival was an event to remember in Morzine. The annual August festival couldn’t have gone much better this year. Over 500 people came down to L’Aubergade and celebrated the summer with proper sausages, local beer & West Country cider (cheers Westons & Woodhalls Brewery). From home-made Jack Daniels & Caramelised Onion bangers to Old Rosie Scrumpy Cider – Morzine’s locals and holiday makers enjoyed the finer things in life whilst soaking up the alpine rays. This year we had Martin Luke Brown, Diamond Thug, Van T & My Nine Lives provide the soundtrack to the day. Martin Luke Brown has recently been getting Radio 1 airtime and toured Europe with the fantastic Jack Garratt earlier in the year, whilst Diamond Thug flew from South Africa and stayed with us for a week to experience the French alps for the first time. A massive thanks to the sound guys for providing the sound and the L’Aubergade staff for putting on a great event! As always – the Cider, Ale & Sausage Festival is in aid of charity. This year we chose LA CASERNE DES POMPIERS MORZINE and their associated charities. Having a close relationship with the fire service in the UK and knowing Morzine locals who have been effected by fire, we thought this would be a great opportunity for the town to get together and support such a great service. This year Morzine raised a huge €1137.68 through a charity raffle supported by over 40 local businesses, with a proportion of the local trade stalls profits going to the chosen charity. This will just be one of many charity events at the hotel this year, with over €3000 raised through events at L’Aubergade in the past year. Follow the L’Aubergade Facebook page to keep up to date with all the up and coming events and news. Alternatively, visit the hotel website and reserve your bed for next years Cider, Ale & Sausage Festival on Saturday 12 August 2017. Previous: Remember The Art of Flight? Well Red Bull Just Released The Fourth Phase! Next: August Travel Deals. Do you need a break?